Last week I took you on a Spring Tour of our garden. It didn't always look like this and when we moved into our house in October 2000, the yard, especially the backyard, looked pretty rough. This week I thought I'd share how it evolved over the years. This is how it looked before we began landscaping. You can't really see in the photo, but there are huge fuzzy vines climbing some 30 feet into some of the trees. We had to pull them out with a car because our lawn tractor didn't have enough weight or power on it. 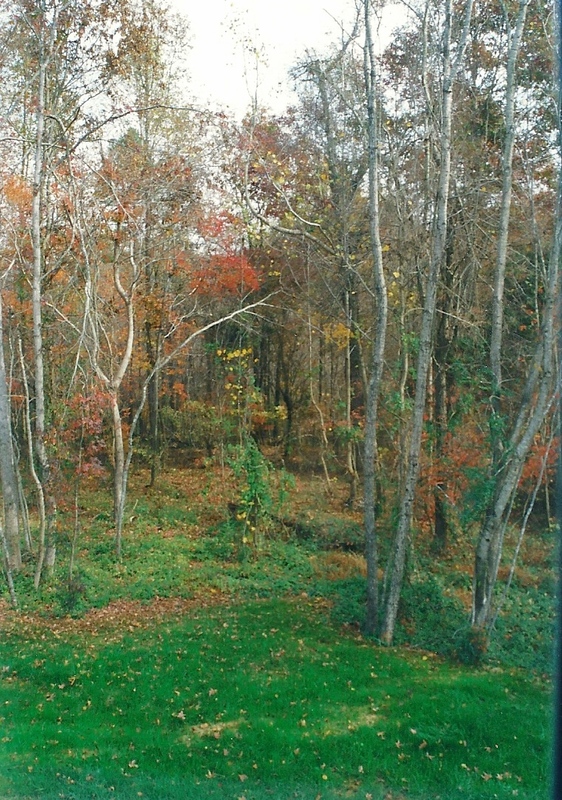 This photo shows the middle right part of the backyard. 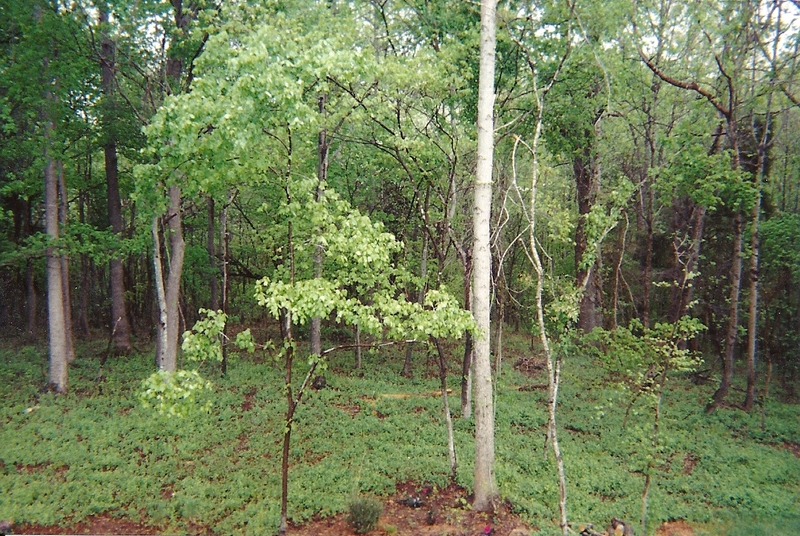 This photo shows the left side of the backyard. I drew up a plan on the computer before we even began. We planted shrubs, plants and flowers a section at a time since we were doing all of this ourselves. We had to cut down a few of the smaller trees to make room for our girls playset. Digging out stumps and roots is sooooooo much fun! This first section was pretty rough and the playset looks so small. Everyone in our neighborhood seemed to have a huge playset, but we brought ours from SoCal and it barely fit in our backyard there. We weren't about to purchase a new playset since the girls would only be using it for a few years at best. When the girls grew out of playing on the playset, Mr DIY installed a paver patio in it's place. 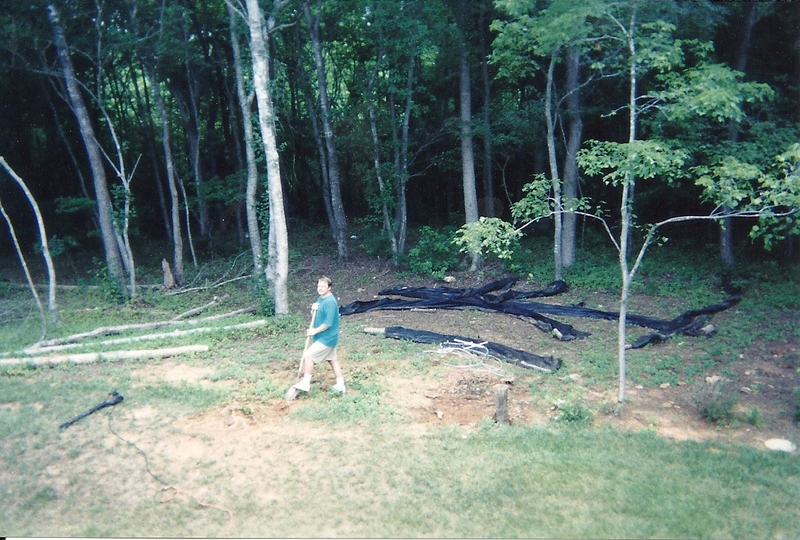 We originally had two paths in the woods that went all the way to the other side of the yard. Several years later we combined the paths to make one larger one. It made getting the lawn tractor through to the woods a little easier. 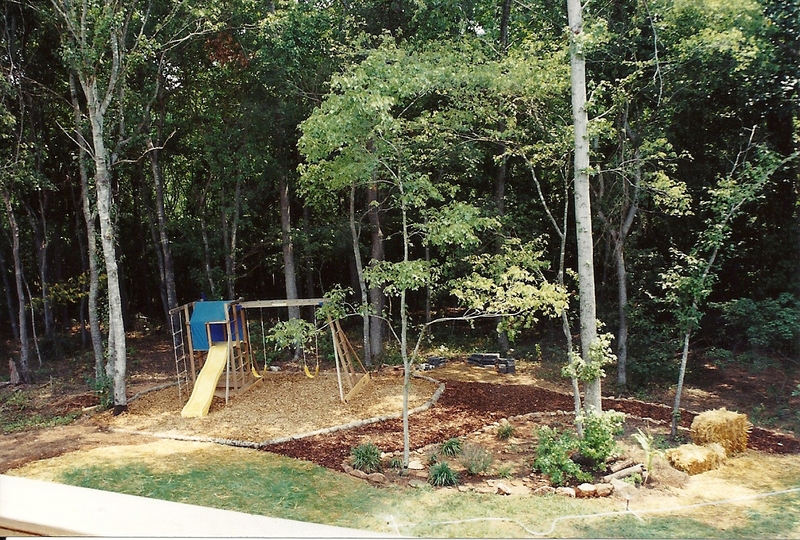 A few years ago, we moved my playhouse up about 35 feet and moved the path, as well. Here's a photo taken at the same spot last week. 4 years ago we built some raised veggie beds on the South side of the house after taking out some large loropetalum shrubs that we grew tired of trimming twice a year. You can read about that HERE. The following year Mr. DIY built some raised beds on the North side of the yard. You can read about these raised beds HERE. As you can see, our yard is ever changing to suit our needs. I'm always moving plants around and digging in the dirt. 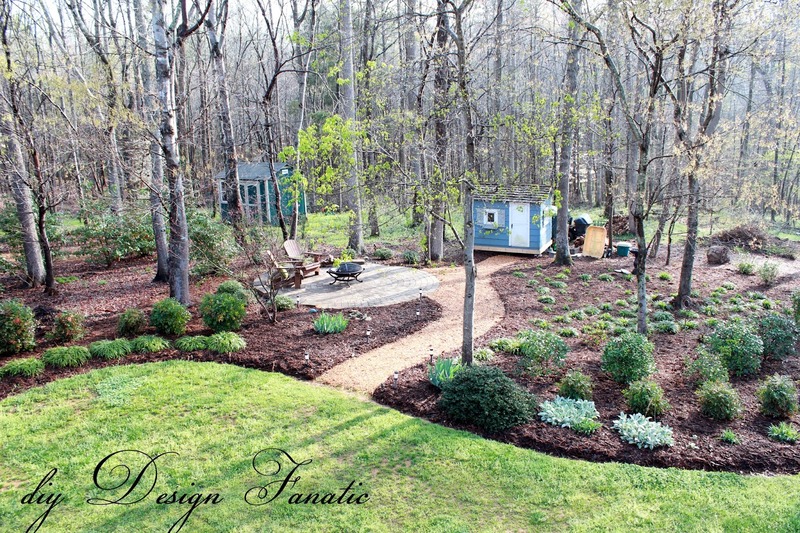 Do you love to garden and change things up in your yard, or does it stay the same every year? Hope you're having a fun weekend. Pam, your property is amazing! Lots of fabulous changes! I adore your raised beds! Just beautiful!!! I think the vision you had, have had, and still have…is amazing! It is so difficult to see a raw garden space like this and know where to begin. You just have to plunge in I am guessing! The other amazing thing is to have done it all yourselves! Needless to say, it looks fantastic. What is behind your property? It looks as though the woods extend quite a way beyond you? Or are there neighbors back there? Very very nice job Pam! What an inspiration this post is! I love seeing the before shots to show how your hard work has paid off! Gorgeous!!! 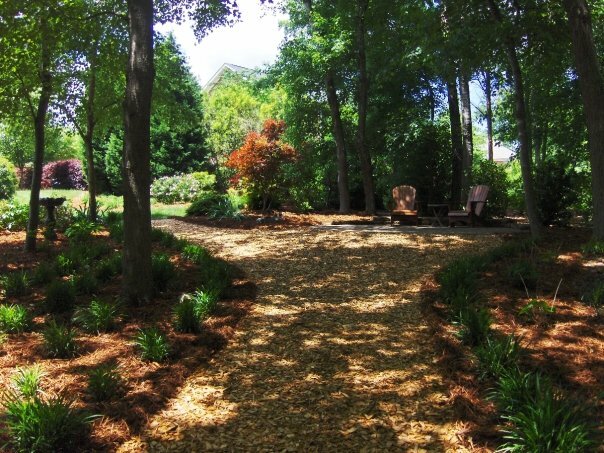 Your garden is amazing and I would like to do something like that in the wooded part of my yard. I have 2 questions though. 1. Do you have ticks in your woods? We have deer and so have ticks. 2. Do you use a leaf blower to blow the leaves off of the paths in your wooded areas? Hey Linda, I couldn't find an email for you, so I'm responding directly on the blog and hope you see it. We do have deer and ticks in our woods, although I haven't seen any this year yet. We don't spray for them, but I check our cats before they come in and check myself as well. 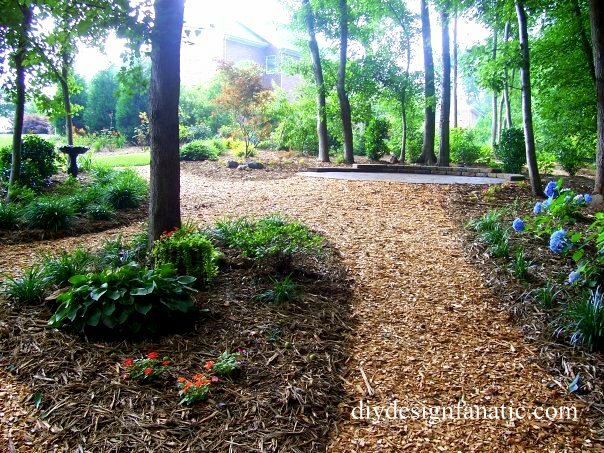 As for the leaves, that is the most difficult task because the leaf blower blows the chips onto the mulch as well. Utterly magical! I can't fathom how much work it took/takes to keep up, but it is stunning! An oasis. It looks great Pam! Lots of work, but looks fabulous! You guys have done an incredible job. Looking at the landscape plan is almost overwhelming! I've never made much of a plan, other than to jot down my ideas and then we'd jump out there and start something. We've been at our home since 1989 and made a lot of changes. I wish I had been better at making selections and choices for plantings. I've had to replace a few things along the way. You had great vision and really made a beautiful yard out of it. I should think that if you ever try selling again, that your home would gather lots of attention! What a transformation!! I love that you still have your play house. Our yard has evolved over the years. Since we put the pool in there aren't a lot of changes from year to year but this year we pulled up some things & I'll be planting some new stuff. 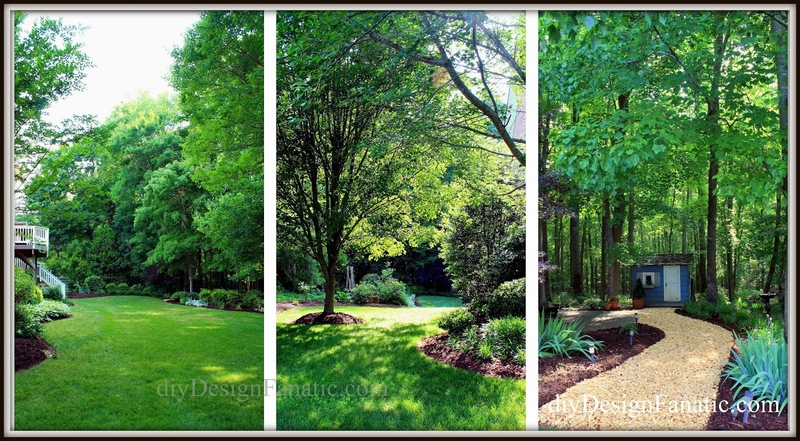 Love how your yard has evolved! What program did you use to draw your plan on the computer?